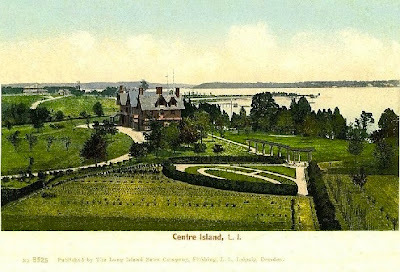 'The Folly', the George Bullock estate designed by Renwick, Aspinwall & Owen c. 1899 on Centre Island. Bullock was chairman of the board of Erie Railways Co. and president of International Burners Corp. 'The Folly' was demolished in the mid 1950s but stood HERE. Zach, I don’t think that’s ‘Applegarth’ in the postcard – count the roof points in the front of the house vs. previous postings, plus ‘Applegarth’ had a turret to the right of the front door & the house in the postcard does not. Plus the house in the postcard has a porte-cochere, which ‘Applegarth’ didn’t. Did it undergo some major remodeling before it was demolished & replaced by a house every bit as large if not larger? Well it wouldn't be the first time I've misidentified an estate. In my defense I've been sick for three days and got about 40 minutes of sleep last night. So which house is this? You're correct Doug...thanks for pointing out my error. To my foggy brain I swore this was 'Applegarth'...but I clearly wasn't looking closely enough. At least it was the same architectural firm and decade. I could have been really, really off. I think that makes me like 367-4. Not a terrible record. Is that supposed to be the stern of a Spanish Galleon as the boathouse? Looks like a fun structure. The postcard also shows a large sand bar protruding into what would be Oyster Bay Harbor, so the post cant be correct. Zach, your record is impressive compared to anyone’s. But you’ve misidentified three other estates? Damn, now I have to go back & figure out which three (no, don’t tell me). Don't think I didn't notice you've now identified this estate as one not previously posted, so no comparison can be made; very convenient. Sorry you’re ill; I hope you feel better soon. Otto is a very nice dog but I bet he makes terrible chicken soup, so go to Plan B on nourishment.